In the last few posts I have outlined in great detail how to make a simple Revit Add-in using the IExternalCommand implementation. Doing that is a great and really fast way of adding new tools to Revit, but after a while we will realize that we just need a little more organization. Luckily for us Revit API offers a way to create our own tab in Revit and an array of different ways to add buttons to it. For the sake of keeping this tutorial simple and easy to follow, I will only show you how to convert our all-ready CurveTotalLength tool to a button. 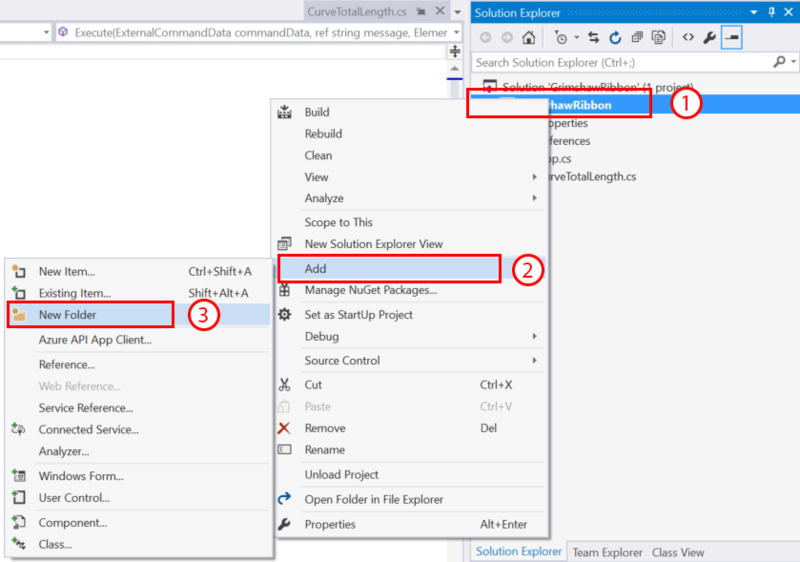 On the right hand side, in our Solution Explorer I will first change the name of the CurveTotalLength cs file from Class1.cs to CurveTotalLength.cs. Now, let’s just “Build it” and we can close that file. 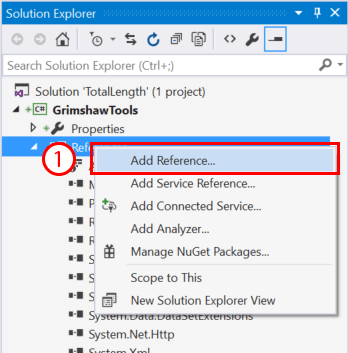 This was just a quick maintenance procedure to make sure that our file is named properly because next what we will do is import that file into a new Project in Visual Studio. 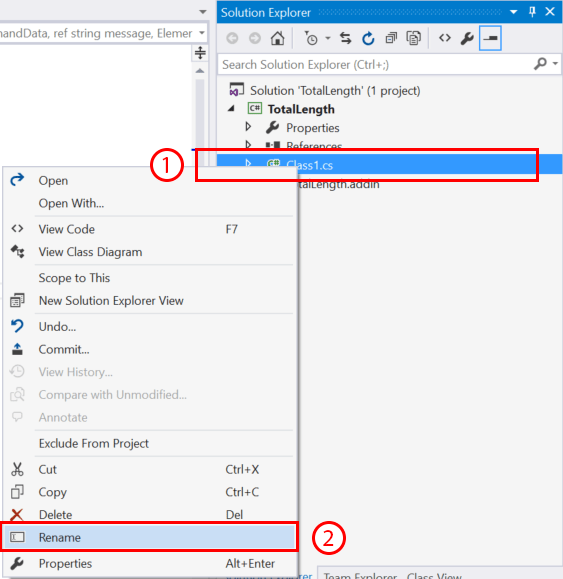 Unfortunately there isn’t an easy way to just take an existing project in Visual Studio and rename it. The easiest way is to actually just create a new project and add an existing one to it if needed. At least that’s what I have been doing. So let’s create a new project in Visual Studio. This step was described before here. 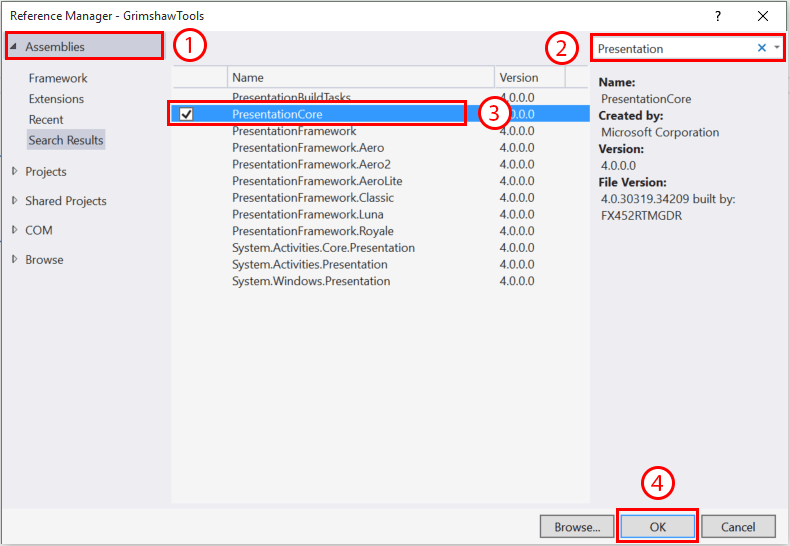 We will call it GrimshawRibbon, but you can call it whatever you want – just remember that it’s not easy to rename the project folder structure after it was created. Next, just like we discussed before we need to reference in Revit API and Revit APIUI libraries. Again, look at this link here. Right click on our project. 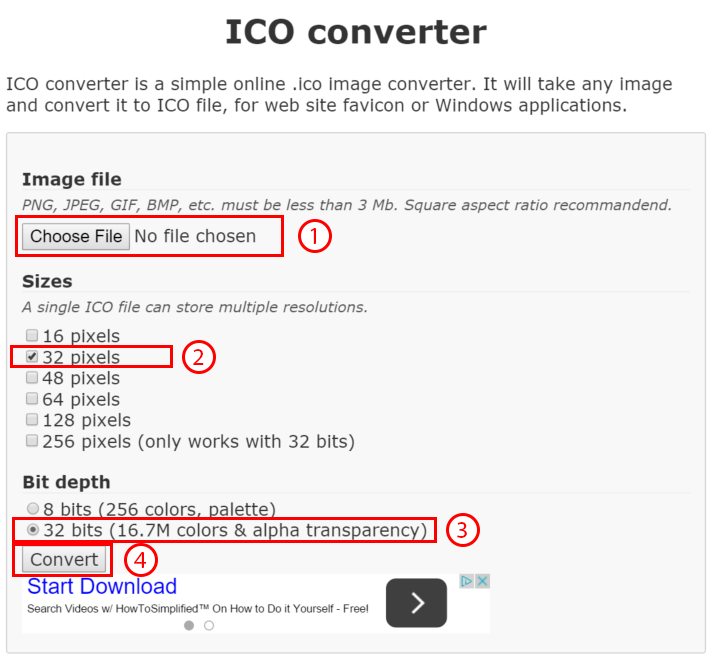 Before we start implementing the IExternalApplication, we need to make sure that we have all of the “using” statements as well as one more assembly loaded (PresentationCore), that we will need to define an icon/image for our button. Click on “Assemblies” on the left side. In search field type in “Presentation”. Select PresentationCore from the list. *You will notice that we also defined using System.Reflection in code below. System is loaded in by default so there was no need to add it in, and all we needed to do was just type “using System.Reflection” to start using methods defined in that assembly. This defines what kind of method we want to create. For our purpose a “static”, “void” method will suffice. Static means that we are creating a method that can be invoked without first creating an instance of its parent class. Void means that our method will not return anything. This will be the name displayed on our tab. Here we create an instance of a new tab with the given name. Here we create a new Panel which will be added to our Tab. We call this panel Tools. 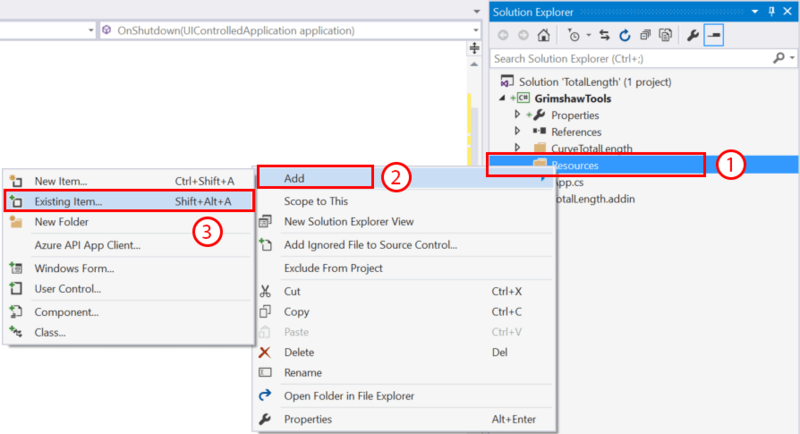 Here we use Reflection method called Assembly to get a path to folder that our application is being compiled to. this is text that will be displayed under our button. I wanted our name to be two lines hence the System.Environment.NewLine piece of code. this is the name of the method that will be called including a namespace. Here we add the new PushButton to our Panel. Here we define a tooltip message that will be displayed when user hovers over our button. Here we define a BitmapImage from the source. Bear in mind that it has to be defined as a URI source so we are creating a new instance of URI like so: new Uri(“pack://application:,,,/GrimshawRibbon;component/Resources/totalLength.png“) where “GrimshawRibbon” is the name of our current project followed by “;component” and then a “/Resources” which is the name of the folder we put our image into, then finally “/totalLength.png” which is the name of the file itself. Here we set the LargeImage property of the button to our image. 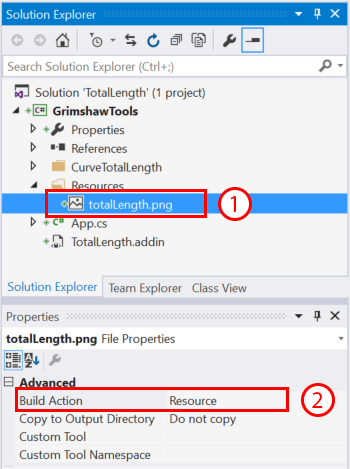 Make sure that you are changing the addin file Build Action to Content and its Copy to Output Directory to Copy if newer. Adding your own tab will probably make you realize that having a whole new tab just for one tool is kind of meaningless and you will set out on the path to fill it up with things that will make your life as a Revit user that much more easier. I have been doing this for a few months now, but I am up to 15 custom tools that I created for our office. Some are really simple like the one we were working with during this tutorial series, and some are a little bit more involved. Either way, having your own toolbar in your favorite application will for sure give you at least a small reason to be proud of yourself. Thanks for sticking it out with me. It has been a long tutorial, lots of steps involved, but if you got through then its all it matters. Also, if I have missed anything – forgot to post an important image, skipped an important step – please let me know. Absolutely enjoy these posts Konrad. It’s about time someone explains the process in a easy to follow way! Kudos! Agree, I had to learn the hard way so you guys have it easy. :-) You are welcome! I’ve been struggling months trying to figure out a proper way to include my macros in an organized panel within the ribbon. Thanks a lot and congrats for the amazing job. For Revit 2016 it work like a charm, but when I’ve tested it for Revit 2014 it doesn’t work. Have you any advice how apopt it for Revit 2014? Yes, I would recommend going to Start>Control Panel> Programs> Revit 2014 and hitting that Uninstall button on top of the window. :-) After the initial shock and nostalgia passes, believe me, life is better in year 2016 AD. But, seriously I can’t help you here. I refuse to provide backwards compatibility and localization issues help. I know, I am a horrible person. I will burn in hell, but at least it will be a modern one. Peace! Konrad, you make me laugh! I’m totally agree with you, but unfortunately, those who are creating content for Revit MEP are forced to use Revit 2014 or even worse Revit 2012 to insure backward compatibility. That’s why I was looking for a solution at least for Revit 2014. Nonetheless, thank you for your reply! Adam, first thing that I would check is to make sure that you are referencing in RevitAPI and RevitAPIUI dlls from the 2014 location. Then try and compile. If everything works then you won’t have to anything else. If however, it doesn’t compile because I used some methods that were added to Revit API post 2014 version (I am not sure if I did, since I never built this particular plug-in for older versions) then you will have to replace them with their older versions, or it might not even be possible. I can’t tell because I never tried it myself. Please see the answer below. And redefine a new button, then add it to the same panel? It doesn’t look like these examples are doing anything different. Defining the push button data, then adding it to the panel. Next button, defining the push button data, then adding it to the panel. Looks like I’m missing something somewhere. If you have any thoughts on this, much appreciated. I have just followed the three steps to create a Addin, and finally this to create my own Tab! There where some bumps on the way. 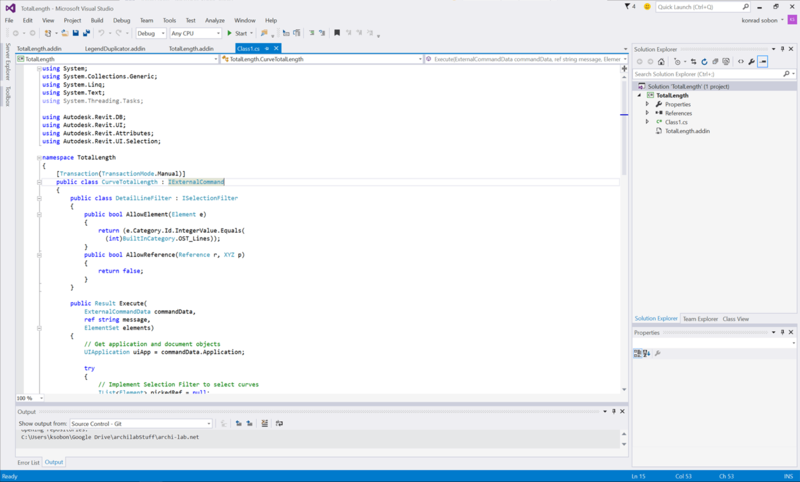 But with a little logic, and help from Visual Studio. You guide is perfect! Thanks for the posts they’re very informative. I was wondering if it is possible to amend your code so I can add scripts which I have made in dynamo to the ribbon. I’m not that savvy with coding so I haven’t figured it out yet, a bit of a learning curve but I’ve been wanting to learn for a while now so this will push me! Awesome tutorial, Konrad! Thanks for making this so very easy to comprehend. Best of luck at the new place! There was a mismatch between the processor architecture of the project being built “MSIL” and the processor architecture of the reference “RevitAPI”, “AMD64”. This mismatch may cause runtime failures. Please consider changing the targeted processor architecture of your project through the Configuration Manager so as to align the processor architectures between your project and references, or take a dependency on references with a processor architecture that matches the targeted processor architecture of your project. This is just a warning. You can ignore it. As far as I remember I have been getting it for the past 5 years. The issue above was solved by changing the debugger target framework to 4.5 and processor to x64. However I have one more question. Is there a way to add python scripts to these buttons. I’ve written a few python scripts that I would like to make into a button. Advice? 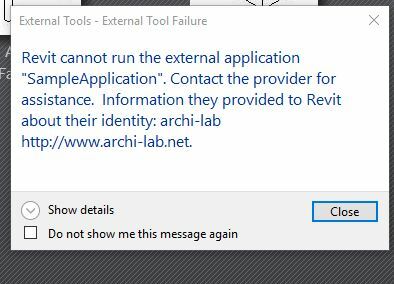 But i did everything you said and when i start Revit 2018 i get the message shown in the picture? Can this be solved or has it something to do with the Revit version? This is the first time i am visiting your website. And this post is really helpful for beginners like me.